﻿ Granada 1-2 Real Madrid. Modric saves the day! 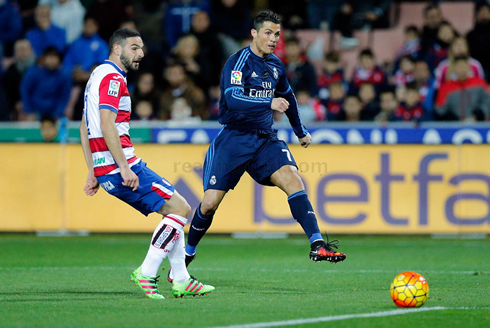 07.02.2016 » Granada 1-2 Real Madrid. Modric saves the day! Real Madrid kept their title hopes alive tonight thanks to a late goal from Luka Modric, which allowed the Merengues to leave Granada with a critical 2-1 win and the 3 points in the bag. For now, Barcelona stays 4 points clear on the top. Not quite the easy ride some Madrid fans envisioned for today's trip to Granada, but Zidane's men managed to rescue the 3 points and keep on Barcelona tail. It was late and Madrid seemed to be staring yet another disappointing away draw in the face as the clock neared 90 minutes at the Estadio Nuevo Los Cármenes. 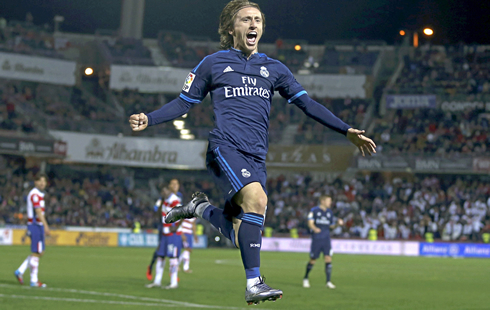 However, and as all seemed lost, Luka Modric, the engine of the Merengues, saved the day with a brilliant strike into the top corner near the death. The opener was scored by Karim Benzema, still in the first half. It was a largely uncomfortable match for Madrid, in no small part due to a fantastic performance by a scrappy Granada side that were determined to get something out of the match. In recent home games, Madrid have been able to kill off their opponents early, but from the opening whistle it was clear Granada, who've played Madrid brilliantly this campaign, was having none of it. 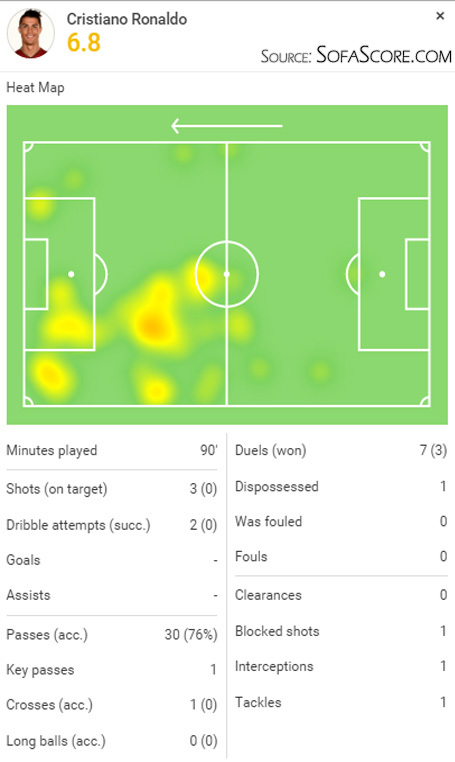 The home side pressured early exposing the gaps between the Madrid midfield and defense, sadly a recurring theme this season, and putting Keylor Navas to the test. Success Issac, Granada's pacey Nigerian, was a constant thorn in Madrid's side all game long. The Merengues would weather the early storm however and go ahead after 30 minutes thanks to some excellent work from Dani Carvajal down the right flank. Finding himself free after a great ball down the wing, the Spanish right back squared to Karim Benzema for an easy tap in. It was the 19th goal of the Frenchman's league campaign, tying him with Cristiano Ronaldo for the team's leading scorer. The second half would see Granada rewarded for their efforts however, as an inadvertant screen by the referee on Luka Modric freeded Youseff El Arabi. The Moroccan sprinted through on goal and finished on an onrushing Keylor Navas. Modric was irate at being blocked by the ref, but there was nothing he could do as Madrid stared another draw right in the face. But as luck would have it, Modric would get his revenge in the end. Madrid piled players forward in hopes of a late goal and Modric found a way to pick up the ball at the edge of the box and fired a strike into the top corner past the keeper and into the back of the net. A fantastic goal from a fantastic player and Madrid's blushes were spared. Cristiano Ronaldo next game will be for Real Madrid in La Liga on the 13th of February of 2016, against Athletic Bilbao. You can watch Juventus live stream, Real Madrid vs Athletic Bilbao, Valencia vs Barcelona, Peterborough United vs WBA, West Ham vs Liverpool, and Bochum vs Bayern Munich, all matches provided from our football live streaming game pages.